Singer Rain, who is gearing up to conquer the world stage, has sold out the tickets for his Hong Kong concert as part of his world tour "Rain's Coming". As a result, Lee In-kwang, the president of Star M Entertainment, which is in charge of Rain's world tour, has expressed confidence that the tour will become successful. "We put priority on concerts in China and the U.S. in this tour. Due to the successful concert in Las Vegas, more concerts can be planned in more U.S. cities including New York and LA, and China is one of the new markets we can explore", Lee said. "I will do my best for the planned tour to serve as a stepping stone for Rain to rise to world stardom". 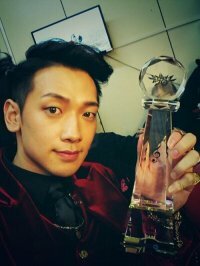 Rain signed a partnership deal with Korean Air for his world tour on Monday. At a press conference held before the signing ceremony, the country's largest carrier released an airplane bearing the singer's picture, which will begin flights to coincide with his Hong Kong concert. Having decided to sponsor Rain's world tour as part of its win-win strategies, Korean Air will operate the flight from January to May. It will also provide free flights for some 80 tour staff members and 20 tons of concert equipment. The "Rain's Coming" world tour began in Seoul on Dec. 15 and 16, with the Las Vegas concert held on Dec. 23 and 24. The Hong Kong concert is scheduled for Jan. 12 and 13, followed by Singapore on Jan. 21, Malaysia on Jan. 27, Thailand on Feb.3 and Vietnam on March 10 and 11. Other nations on the tour include Taiwan, China, Japan, U.S. (LA and New York) and Canada (Toronto). Korea's glitterati will participate in a concert to raise funds for the International Vaccine Institute, which is to be held at the Osaka Dome in Osaka, Japan, on Jan. 23.